Welcome to the Chapel of Unity, a community working for reconciliation in a unique building in the heart of Coventry. The principle of a Chapel of Unity binding the Church of England and the Free Churches together for Christian service in Coventry was born out of the sufferings of war and the ecumenical enthusiasm of the church leaders. In November 1945 the West Crypt was dedicated to this principle and, with the building of the new Cathedral, the opportunity was taken to create a purpose-built chapel. 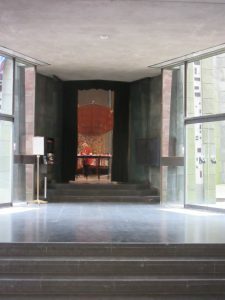 A stone of witness was laid in the entrance on 24th September 1960, and the Chapel of Unity was dedicated on Whit Tuesday, 12th June 1962, a fortnight after the Cathedral itself. Since then the Chapel of Unity has been owned on a 999-year lease by a Joint Council and is managed on their behalf by a Commission of the Churches Together in Coventry and Warwickshire. Ecumenical services are held each week on Tuesdays at 1.05 pm and on Wednesdays at 8.00 am (followed by breakfast in the Cathedral Lecture Hall). In 1962 there was virtually no communication between the Roman Catholics and other denominations but by 1970 the constitution of the Joint Council had been changed to include them on equal terms. The form conceived by the architect (Sir Basil Spence) for the Chapel of Unity was that of a tent, the temporary home of a people always ready to move onwards. The exterior walls are clad with green Westmorland Slate, which contrasts pleasantly with the pink sandstone of the Cathedral.